In this second part of a three part audio feature, we look at the conduct of the War of Independence on the ground. Three historians discuss whether the War of Independence was really a sectarian or “ethnic” conflict as well as a national liberation struggle. Contributors, in order of appearance, are Fearghal McGarry, John Borgonovo and Niall Meehan, questions by John Dorney. 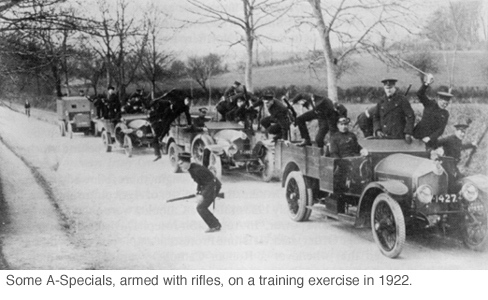 What we in the south of Ireland call the War of Independence, 1919-1921, was very much a secret war. It was conducted by guerrillas, operating in remote rural areas or mixed with the civilian populations in the towns. For this reason, much of what went on remained hidden from view. People were abducted and shot and left in ditches without anyone really knowing who had killed them or why. In this context, the conflict varied very much from one area to the next, with each band of local guerrillas and Crown forces locked in their own private wars. In this context also, local vendettas flourished, so we must be careful when talking about broad trends, the conflict may well have been sectarian in one locality and not in another. Here we talk as generally as we can, about the conduct of the war and about two areas in particular, Cork city and county Monaghan. Fearghal McGarry, who studied the conflict in Monaghan, located on the borderland between the mostly Catholic south and mostly Protestant north, argues that it was, “basically a communal conflict”. Both Catholic nationalists and Protestant unionists were communally organised in rival militias. And yet all-out sectarian warfare never broke out. The IRA targetted its enemies, be they Catholic or Protestant, though McGarry argues that it was more likely to raid or shoot Protestants. 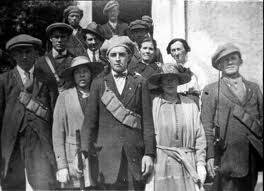 The IRA in Macroom, Cork. John Borgonovo, who has written on the war in Cork city, argues that the IRA did not target Protestants as Protestants and that if they shot people as informers, they genuinely beleived this was the case. Niall Meehan argues that the conflict was more ideological than sectarian, “people fought for what they believed in, be it the British Imperial idea or the Irish democratic idea”. He also argues that the active mobilisation of southern loyalists has been insufficiently studied. Irish Protestants he argues, emphatically denied that they were targeted by republicans for their religion. When speaking of the differences between the conflict North and South, all our contributors agree that the North and particularly Belfast was the one place where there was out-and-out sectarian strife. Borgonovo and Meehan argue that this was down to the blatant bias of the new Northern Ireland authorities, McGarry argues that the conflict over Irish independence in the Northern captial was overtaken by a much more anarchic “mob violence” between Catholics and Protestants, that the IRA could do little to control. Written by: John_Dorney on 16 August, 2010.on 12 January, 2012. 3 Responses to "The Irish War of Independence – A Religious War? Part II"
Why is there no mention of the IRA’s protecting Protestant homes after the West Cork killings? Also, the strong anti-sectarianism of Republican ideology? And what about the long battle for the hearts and minds of Irish people between the IRB and the Catholic Church? The above are decisive in arriving at the answer to the question. Owen, there’s no mention of the IRA in West Cork because the contributors didn’t talk about it. As we said in the introduction to part one, this is not the definitive account, just a sample of the discussion. Re The IRB’s secular ideology and the Catholic Church, this issue is touched on in part one. On this, it’s by no means clear that the IRB/old style republicans won that particular battle for hearts and minds in the republican movement of 1917-23.